Former Japanese prime minister Naoto Kan is in Australia this week on a speaking tour to warn against nuclear energy after his country faced the Fukushima nuclear reactor meltdown that began in March 2011. In his speaking tour, Facing the Fallout, Mr Kan on Tuesday addressed a packed Perth Town Hall with Greens Senator Scott Ludlam, ahead of a site visit to the new Carnegie Wave Energy facility in Fremantle organised by the Sustainable Energy Association of Australia, which was eyeing opportunities for its technology in Japan. Mr Kan will speak in Townsville on Thursday and Melbourne on Friday. Yet despite the dangers exposed by the Fukushima crisis, soaring costs – up to €8.5 billion for a new reactor in Europe – and intensive water use 50 per cent greater than coal fired power generators, the push for uranium mining and nuclear energy continues to intensify. Australia recently signed uranium supply agreements with China and an agreement is being negotiated with India, as both nations seek to replace coal-fired plants. National nuclear campaigner for Friends of the Earth and member of the EnergyScience Coalition Dr Jim Green told The Fifth Estate in June that Australia was unsuitable for nuclear power, and there were many unresolved problems with the technology. Dr Green said water use was a major factor in its unsuitability for Australia, with nuclear power being the most water intensive of all energy generation technologies, with a typical reactor consuming between 35-65 million litres of water each day – roughly 50 per cent more than coal. He also said the cost of building nuclear had more than doubled over the last decade, mainly due to increased safety requirements following the Fukushima disaster. New reactors recently built in Finland had started with cost estimates of €3 billion but had blown out to €8.5 billion – close to triple the original. Read the original story CEDA report says climate change poses a serious economic risk, but is nuclear the answer? A white paper from the Rocky Mountains Institute, The Nuclear Illusion by RMI chairman and chief scientist Amory Lovins and research analyst Imran Sheikh, also reveals the flaws in the business case for nuclear power. The paper looks at a number of economic issues including the high degree of public subsidy for nuclear power, which in some cases reaches 100 per cent, and its failure to attract capital, which is more interested in lower cost options with lower risk. The authors argue that ultimately, the two biggest competitors to any form of large-scale power plant, whether nuclear, coal-fired or gas-fired co-generation are “negawatts” – electricity saved by more efficient end-use and micro-power, including onsite generation and distributed renewables. The issue of where to store the radioactive waste from the nuclear industry is another major issue. In Australia it’s brought government, the industry and Aboriginal Traditional Owners into conflict numerous times, most recently at Muckaty Station in the Northern Territory. Friends of the Earth reports that under the Howard Government, Australia joined the US-led Global Nuclear Energy Partnership, a scheme in which supplier nations take back high-level nuclear waste from user nations that operate reactors. From the late 1990s until 2002, Pangea Resources lobbied to establish a high-level nuclear waste dump in Australia. In 2002, the company did a rebrand and re-emerged as ARIUS – the Association for Regional and International Underground Storage, and continued to lobby for Australia to accept waste from nations that buy our uranium for their power plants. South Australian Greens MLC Mark Parnell referred to this resolution in his private Members’ Bill of August 2007, Bill to Ban Nuclear facilities in SA. National Indigenous TV is airing a documentary and Q&A program on Wednesday night, which documents the seven-year battle fought over Manuwangku, known as Muckaty Station. The film highlights the determination of Warlmanpa and Marumungu people to defend their land and culture, and to keep Manuwangku nuclear free. Following the documentary, Stan Grant will host Awaken’s Uranium, Friend or Foe, a forum discussion of the issues around the past, present and future of uranium mining, waste disposal and nuclear technology in Australia, and how the industry comes into conflict with Traditional Owners on Aboriginal land. The panel includes Traditional Owners of Muckaty Station in the Northern Territory Dianne Stokes and Kylie Sambo; Pitjantjatjara homelands representatives from the Maralinga area Rose Lester and Sue Haseldine; social scientist and Adnyamathantha custodian Dr Jillian Marsh; renewable energy guru Dr Mark Diesendorf; chair of the Prime Minister’s Advisory Council Warren Mundine; the University of Queensland’s new Dow chair in sustainable engineering and former MIT professor of nuclear engineering Professor Eric McFarland; and director of pro-nuclear consultancy Think Climate Consulting Ben Heard. 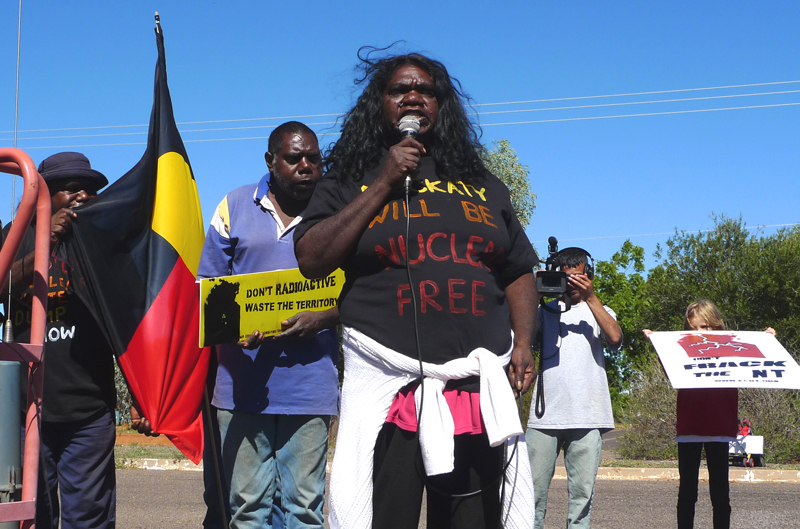 Protecting Manuwangku screens on NITV on August 27 at 8.30pm, followed by Awaken – Uranium: Friend or Foe? at 9pm.